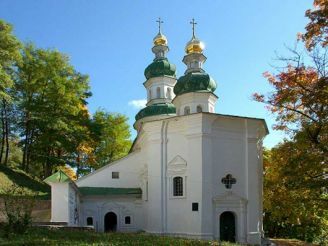 Pyatnyts’ka Church (St Paraskeva Church), an outstanding monument of Kyivan Rus’, is located in the ancient city of Chernihiv. 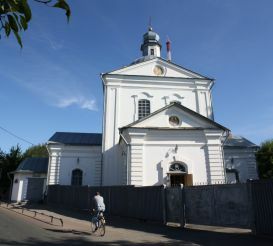 The church was named in honour of the Christian martyr Paraskeva, who was canonized. She is considered the patroness of fields and cattle, a healer of mental and physical diseases. Paraskeva has long been revered as a patron of trade. The church was built on the market square. For many centuries St Paraskeva Church is an active religious temple. Locals call it the "pearl" of ancient Chernihiv, which impresses tourists with its unusual and fascinating architecture. 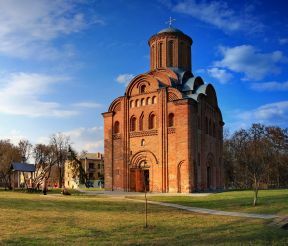 St Paraskeva Church was built in the late 12th - early 13th centuries by Peter Miloneg, a famous architect of Kyivan Rus’. This is one of the few surviving monuments of the pre-Mongol period. It is an outstanding right-angled building, which with its straight vertical lines on four sides and with the step-like dome reaches the sky. The upper arches climb up one after another in the form of a pyramid with a high tower on the top. 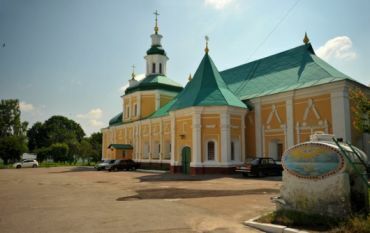 The walls of Pyatnyts’ka Church are bricked with plinthites made using Roman techniques called "the box". The secret of this brickwork lay in the fact that between the brickwork there is a small space filled with lime and concrete. In addition, you can see step-arches rising to the window-slits inside of the building. Apparently, this temple was used for defensive purposes too. According to legend of Kyivan Rus’, this temple survived, when all of Chernihiv was destroyed by the Tatar-Mongol army in the 13th century. Over 900 years of its history St Paraskeva Church was destroyed and rebuilt several times. For the first time it was rebuilt in 1670. After this reconstruction the church building acquired features of Ukrainian Baroque. After fires in 1750 and 1862 the church was rebuilt twice. The greatest damage was inflicted during the Second World War, when an explosion of an aerial bomb destroyed half of the building. In 1962 the church was restored again. Today we can see St Paraskeva Church reconstructed and designed by architects Peter Baranowski and Mykolai Kholstenko. Today St Paraskeva Church is considered to be a great creation of ancient times. Come inside the temple, and you'll see beautiful murals of the late Russian period, and feel the breath of past centuries.